I’m going to start this review off with a couple of confessions. I am not as well read as Greg Rucka when it comes to the Private Investigator as a genre, but I do share his enthusiasm. I am a huge fan of Greg Rucka’s comic book work. I’ve been reading him for years. Greg Rucka is one of the first comic book writers I had the pleasure of meeting when I first started reading comics. (It was at Midtown Comics signing and he was shocked and pleased to see me hand him the first Gotham Central trade to sign.) 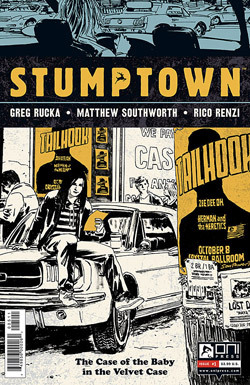 My last confession, I did not know that another volume of Stumptown was happening, let alone coming out, though I was pleased to find out that this was happening. Greg Rucka and I have something in common though, and that is our love of the loner private investigator and mysteries, this comic continues in that tradition. The comic opens up with a band called Tailhook playing a show in Portland. The scene is established as if it was being written like an episode of television. The outside of the venue is shown with the music playing then melting into a shot of the band playing and the crowd going crazy. Having recently been to a concert I thought it was an extra awesome touch seeing people recording or taking pictures of the show on their smart phones. I know that this has pretty much happened since cell phones could take pictures and record videos but I still enjoyed that seeing that in a comic. The band walks off stage to their dressing rooms as the talk about they are going to do now that their tour is over. But just before that we get a character named Graham trying to talk to the lead singer of the group but being rejected. This could be nothing except as character development for Vanessa, the lead singer, but I think there’s more to it as when we read on and know that she isn’t the drive of the case. Then we are introduced to our main character of Dex Parios lead investigator of Stumptown Investigations. She is moving into her office when a man walks in offering her a job. She listens to his case and decides to take it, but then she finds out that the company the man works for is Rain or Shine Construction which is owned by Hector Marenco, at that point she refuses the job and recommends someone else for him. Hector Marenco was a character in the first volume of Stumptown and Dex did not have a good working relationship with him and refuses to work for him out of some sort of honor on her part. She knows he’s a bad person so she will not compromise her honor by working for the man, even if it costs her money. This tells you right away what kind of person Dex is and what she’s willing to sacrifice, money, yes, principle, no. Then the opening scene with the band and the Dex come together. Mim, the guitarist of the band comes in to see Dex because someone stole Mim’s baby, this baby being a 1977 Gibson Les Paul. (If you don’t know what this guitar looks like in real life, look it up because it truly is a magnificent guitar.) We get the standard case overview when it comes to investigations, the almost whole story. I like to call it that because it’s what best describes the situation. It’s not a PI story if the PI doesn’t get all the information up front and it isn’t a mystery if someone isn’t hiding something. Dex takes the case and decides to go question Mim’s guitar tech, Fabrizio Pullano. Here’s where we find out that this man and woman are following Mim, the woman, telling the man to follow Mim while she follows Dex. When Dex arrives at Fabrizio’s house he and his wife are in the middle of being attacked by two fellas looking for the guitar that is missing, Baby. Dex walks into the situation playing it cool while being threatened with a box cutter, she counts down the time it takes for the police to arrive to home invasions, confusing and putting the criminals more on edge. Dex tries to talk with Fabrizio about Baby before the woman that was following Dex shows up pointing a gun at the back of Dex’s head revealing herself to be a DEA agent. Rucka has set the pieces in motion and I look forward to seeing how it all plays out. In writing, everything is done with a purpose whether if a character or action will play out before the end of the story is over or as a red herring. I don’t think we’ve seen the last of Hector Marenco, but if we have, that’s fine. I’m sure there will be more Stumptown stories to come. Also, this issue is very much reader friendly, it’s a great jumping on point for anyone that wants to try this comic.